During my Switzerland tour, I did find best Souvenir shop giving stuff in half the prices and many of the blog readers found it useful during their Switzerland trip. Similar experience I had during Souvenir Shopping in Kenya, they are available inside the lodge gift shops but pretty costly. Also during the road travel you will find many Curio shops, however since you need to head down to the destination for game rides, there is no time to bargain. So I recommend to reserve dedicated time only for shopping & bargaining during Souvenir Shopping in Kenya (in Kenya you need to bargain and only bargain) Get into Nairobi or Nakuru town to explore local markets. Surely you will find the same stuff for 1/3rd prices !! and good variety. 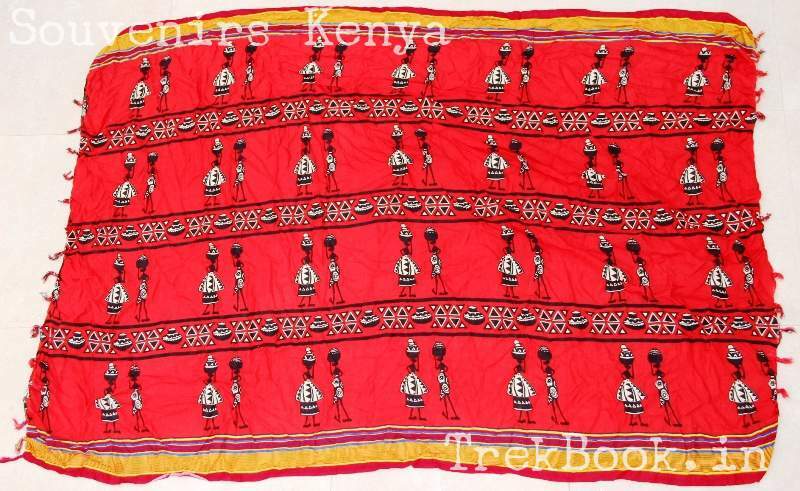 Remember I bought the mummy papa in the first stop to Equator line, where I got them only for 2600 Kenyan shillings ( $25 USD) including the Kikoy (scarf) and that turned out to be the cheapest deal in the complete trip !!!! Same experience during my Swiss trip !!! As we moved on the way from Masai Mara to Nairobi, we spent lot of time in different roadside shops, but most of the time we all came out due to astonishingly high prices quoted by the shop owners !!! and in spite of getting such large business they were not ready to get down on prices !! So it was mere waste of time !! loosing 2~3 hours on the last travel day !!! Re-commanded shop is … stall no. 7 which is located quite inside this shopping complex owner is Risper Njeri Woweru, phone 0722-300726, the owner is very kind and provided best quality souvenirs with best bargain prices for my friend. The Maasai artistic shields displayed outside the shop in below photograph. The shields are bit large to carry back on the plane, but check with shop keeper and he will show how to fold/separate and pack inside the baggage. Every curio shop will have display of batik art from notable artists such as Senkota, Mutyaba and Lukenge. African masks are fantastic souvenirs to gift your friends, it looks beautiful on living room walls. The Wakamba specialize in this type of carving, mostly made using mahogany or ebony. I know its difficult to identify but try to avoid buying cheap painted wood that is polished to look good. I recommend to buy these from the Masai women at the Masai Mara entry gates .. you can get original shapes (at market you get modified to suit western world shapes) Starts from $1 USD to $10 USD. Last but not the least are small wonders that help you service mass of friends to distribute souvenirs for after return !!! You can buy them in Dozens !! Shopkeepers here never ever tell you price of one piece, hence difficult to tell prices, but during bargain you can easily assume $1 USD to $2 USD per piece of keychain or firdge magnet or bookmark.